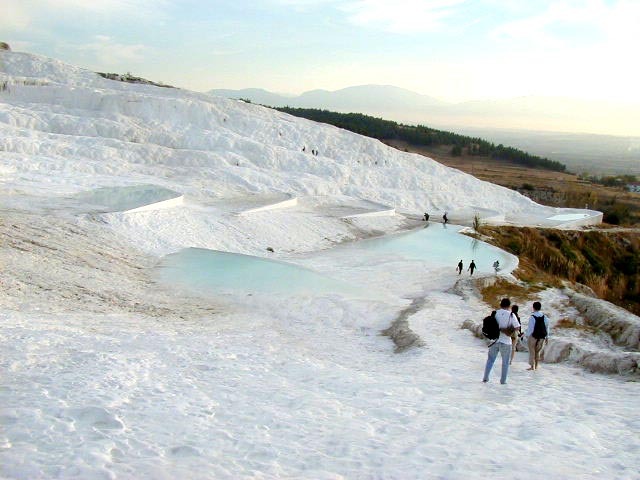 Pamukkale is about a three hour bus ride from Selcuk. 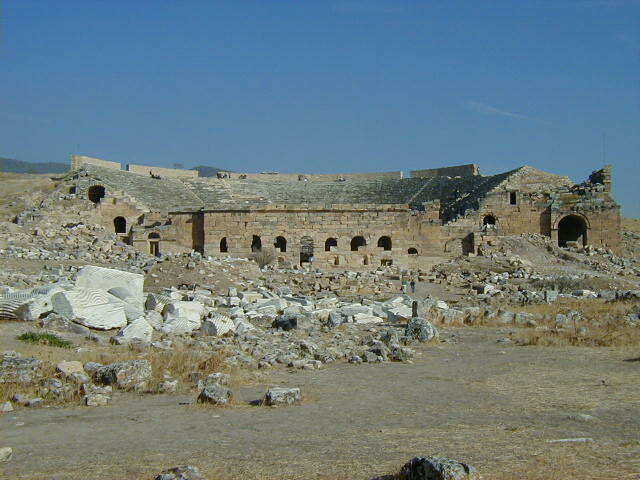 It was once a Greek/Roman spa town. 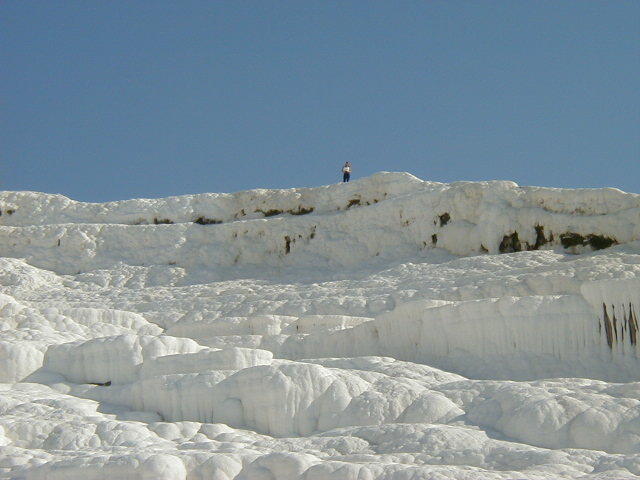 Hot calcium rich waters flowed over the plateau's edge and created many snow white steps and pools. Until about twenty years ago people could spend the day sunning and soaking in the waters, but excessive use combined with sweat, dirt, and sunscreen left the calcium surfaces gray and oily, and incapable of taking on new calcium deposits. Now you are only allowed to walk up the plateau barefoot. It is advertised heavily in Turkey, and all the tourist posters use pictures taken in the '70's before the restrictions, with people in bathing suits lounging in the pools. You see some dated bathing suits and hair styles in the posters. 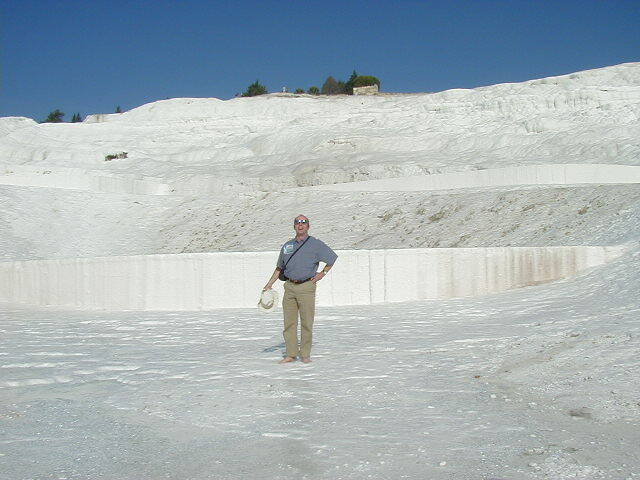 I did not fully appreciate what a tenderfoot I had become until I started walking up the slope at Pamukkale. This was not like walking on grass or a sandy beach. To get this experience, look for a rock garden with lots of pumice and try walking on that barefoot. If your feet aren't used to it, it hurts. 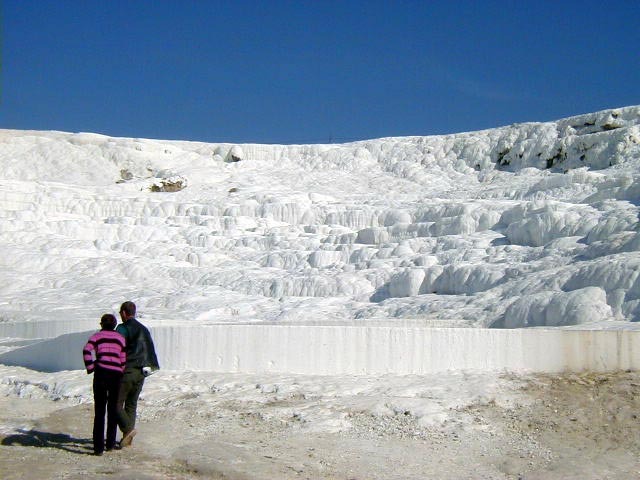 In addition to the hot springs and mineral formations, Pamukkale has a vent in the earth with poison gas rising up from it. 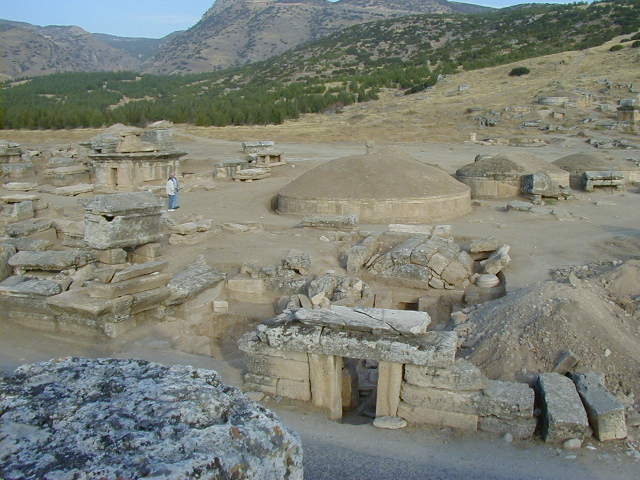 In ancient times this was called the Plutonium, the entrance to the underworld, and a temple was built over it. Priests would hold their breath, enter the vent, and emerge with prophecies. I wonder if any priests failed to emerge. Several years ago three tourists also entered the vent, but they failed to emerge. 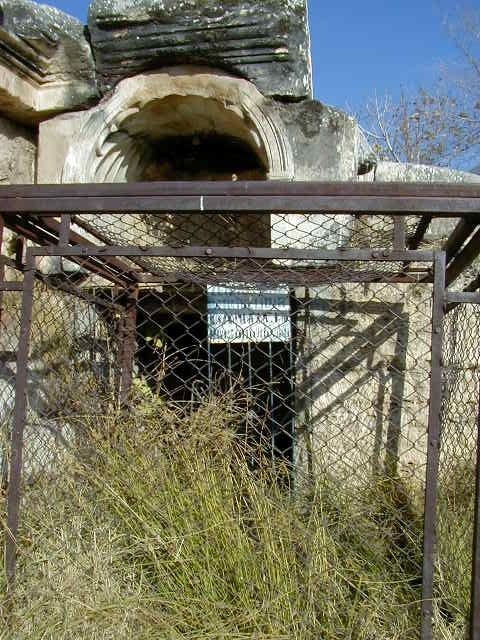 After that the entrance to the underworld was blocked with a wire fence around a steel frame box. It wasn't anchored and didn't look very heavy; I'm sure that two men could move it. I couldn't talk Matt into helping me out though. I just wanted a quick look at the underworld, I wasn't going to go in very far. 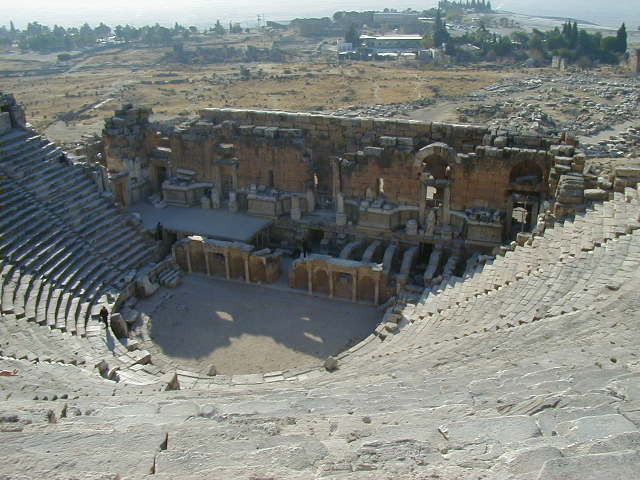 Pamukkale has a well preserved theater that seated between 15,000 and 20,000 people. It still has some of the stage statues left, which is rare. Normally a collector takes off with them. 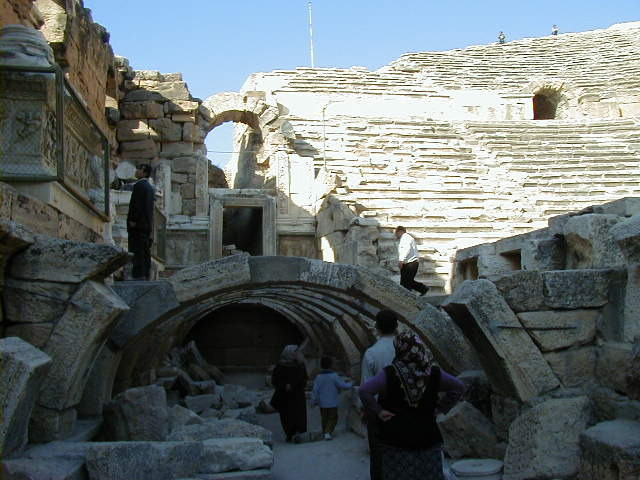 From the top of the theater you can see many reconstruction projects waiting for people with an interest in archaeology. 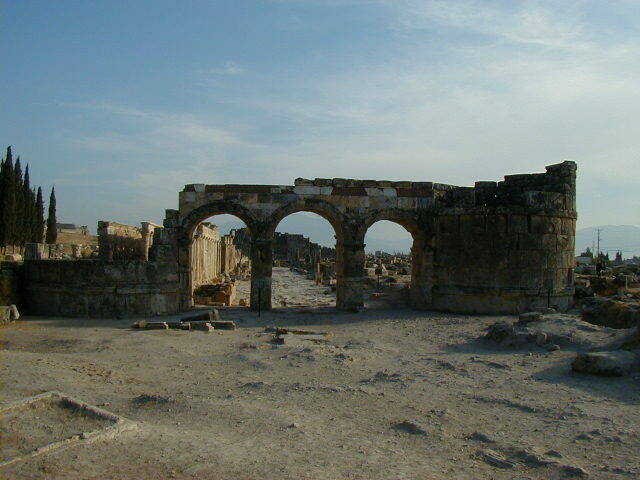 Also on top of the plateau is the Domitian Frontius Gate from the first century A.D. 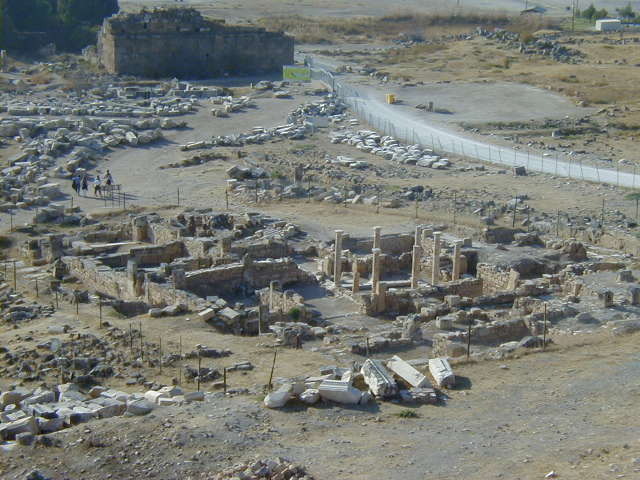 In front of it, on the left side of the picture, is partially buried sarcophagus lid. 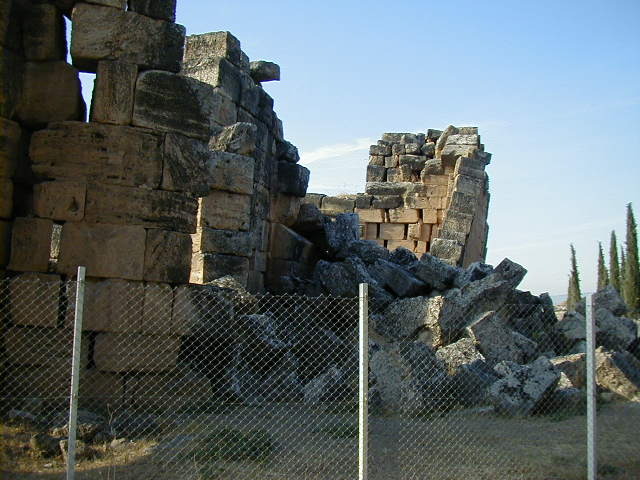 In this part of Turkey it isn't unusual to see sarcophagi, intact or in pieces, lying partially exposed in patches of ground or ditches. 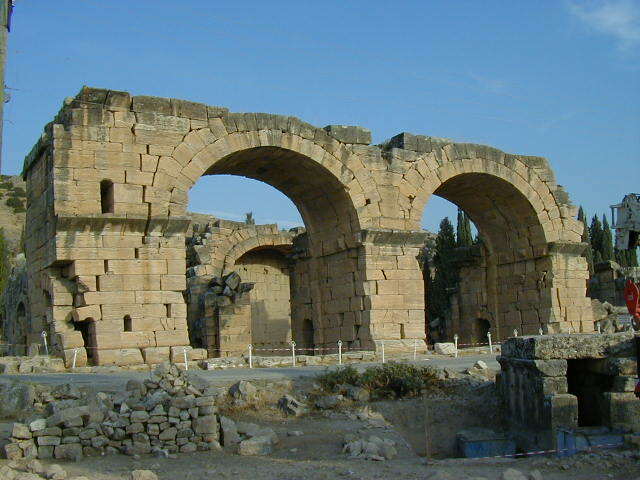 Beyond the Domitian Frontius Gate is the earthquake damaged Grand Northern Bath. That back wall looks like the next big quake could bring it down. Beyond that is the Necropole, with styles of burial chambers covering many centuries. 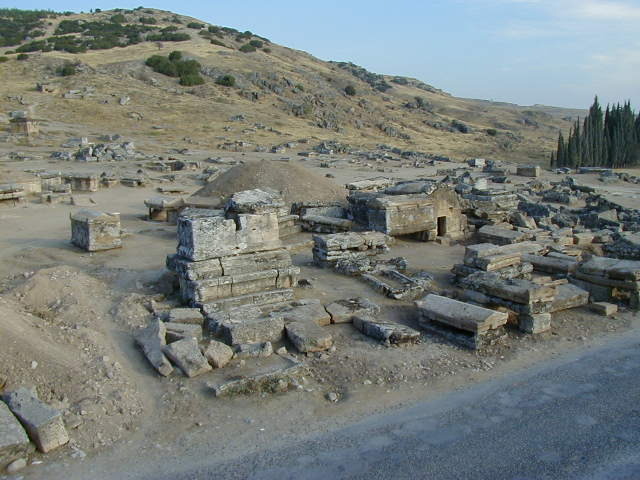 All of them have been opened and looted by grave robbers. I entered one myself, just to check it out. I was happy to see that nobody was home. 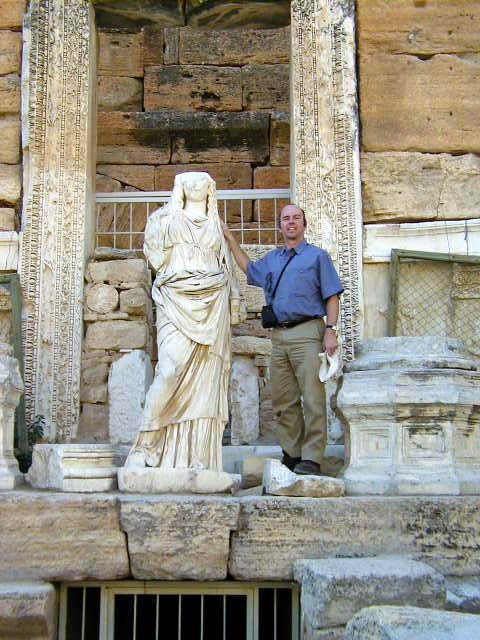 After Pamukkale I made the time consuming trip to Aphrodisias. 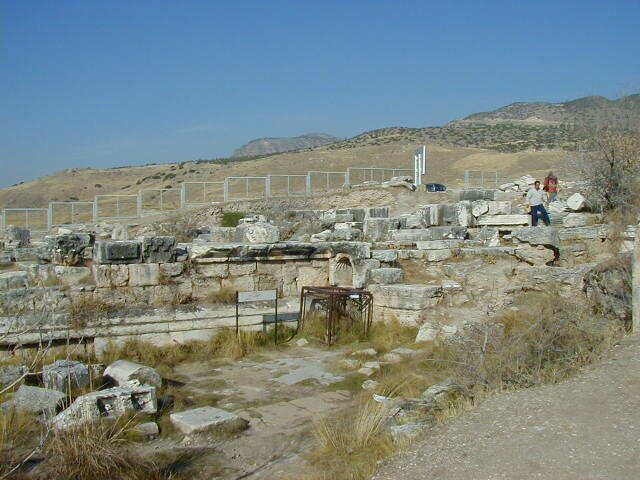 Aphrodisias was discovered relatively recently and is still being excavated. It is a challenge to get to, but I'm glad I went.